Among 60 patients found to have a diabetic foot or hand ulcer at hospital admission, 6 of those patients (10%) were unaware of their ulcer. Unachukwu C. Diabetes foot and/or hand ulcers: A cross-sectional hospital-based study in Port Harcourt, Nigeria. Diabetes Research and Clinical Practice. V.75, No.2, February 2007, Pp 148-152. 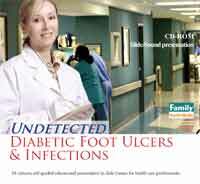 We often remind our patients and residents with diabetes to check their feet every day to avoid a foot ulcer. Unfortunately, with the loss of normal pain sensation to warn them of a problem, people tend to neglect this vital step. It means painless foot ulcers or infections may hide unnoticed and untreated for weeks on end, all the while increasing the likelihood of evermore serious, life-altering consequences, including amputation. As this program explains, all health care professionals ─ from unlicensed support staff to physicians and nurse specialists ─ can reinforce the importance of diabetic foot care and contribute to early detection of foot ulcers with routine 15-second visual and verbal foot checks. This CD-ROM slide/sound presentation is designed for students and health care professionals working with people with diabetes. It is an excellent introduction for students in various health professions on the dangers facing the diabetic foot. The program introduces the quick, 15-second visual & verbal foot check. 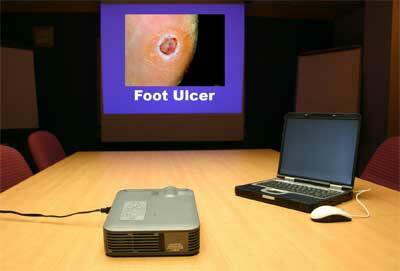 Multiple photographs of various diabetic foot conditions are shown. A short video clip explains the monofilament test. East Carolina University School of Nursing (Greenville, NC) to assist in teaching of chronic complications of diabetes. Janice Neil, RN, Ph.D.
Wellbound, a chronic kidney disease and dialysis services organization, for clinical staff education at its locations throughout California. The CD-ROM includes 2 versions of the program. The Presenter's Version without sound can be presented to an audience using the included PowerPoint® player. Or, using your PowerPoint® software, you can customize this version with your own material and gain access to the included speaker’s notes. The Solo Version with sound is for self-directed use by one person at a PC computer. It takes about 18 minutes to go through the entire program.